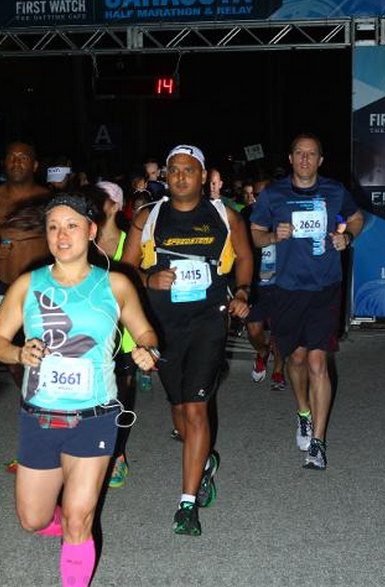 Last year, after having #allthefun at the 2014 Sarasota Half Marathon, I decided to keep up the momentum and registered during the blitz pricing (seriously. $45) and return to this local race – especially since it was going to be an anniversary year. Sure enough, the swag delivered – cool medal (see at the end of the recap!!) as well as a snazzy MPG jacket – but this year, I was running solo, and just three weeks after Tokyo, I was pretty undertrained, but knew I’d have fun anyway. As in most halves that I run without PR aspirations, my “for fun” and “happy” goal is roughly 2 hours – and frankly, given the jungle-y humidity (99 percent at 7 AM start) I went in with the mindset that I’d be pretty happy with whatever finish the day would give me. That easy-going approach (plus my debut use of running with a GoPro!) proved to be a winning combination, as I set out on my 19th half marathon (wow, does time fly!) and not only hit my time goal (1:59:51 with two potty stops and plenty of GoPro doofus-ing around) but serve as an incredible reminder of how much I love running and living here in Sarasota. I broke several “race day” rules – wore a brand new sports bra (Under Armour Armour Bra), tried out new Compression Sleeves (Zensah Ultra Compression Leg sleeves) and ran in new shoes (the New Balance Fresh Foam Zante) – and you know what – it was all fine. In fact, I may have found a second favorite pair of running shoes!! This race was a lot bigger than last year! Between the half and the half relay, it apparently was right around 5,000 participants. I was glad to see corrals this year! The only complaint I had last year was that the start was very congested, so just breaking the start area up a little helped a lot! It took a little while for the course marshals to clear the course, and the race started about 5-10 minutes late…wasn’t too bad, but it was a little awkward waiting, haha. I love running the bridge. I took a picture. Another thing I loved about this race? Knowing so many runners! At the major turn around area (rounding the circle leaving St. Armand’s) I was able to cheer on some of my favorite local fasties (Fernanda! Jo! Johnnie! Rob! ), and when I made the turn, I saw many more friends (Jen! Jean! Stephanie! Kathryn!) There’s definitely something to be said about seeing friendly faces on course. On top of seeing fellow runners, I was stoked to see some of my favorites spectating! Look at these awesome Fleet Feet pals! 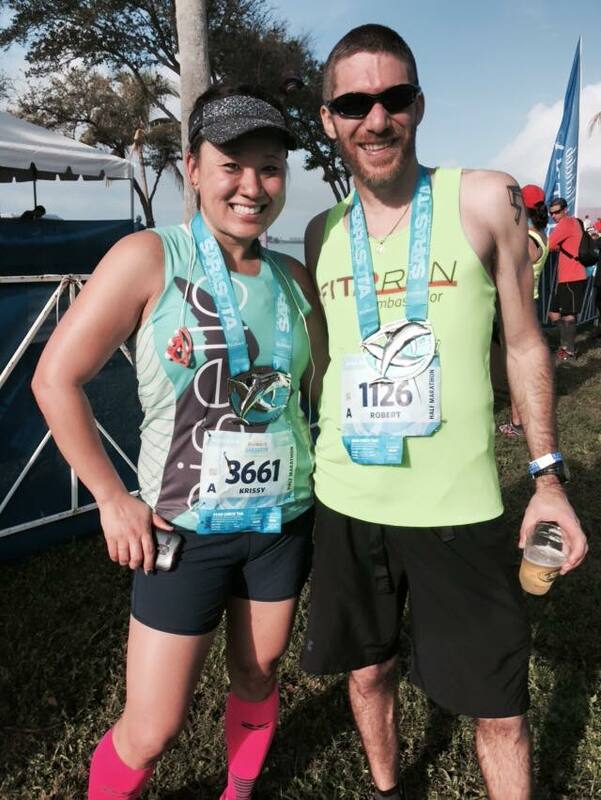 Blitz pricing is scheduled to open again tomorrow, and I am thinking that next year, I’d like to sign both hubs and I up for the relay, since that would be a really manageable distance for him to cover, and it’d be cool to run with him again! What are your favorite local races? This race looks so beautiful! 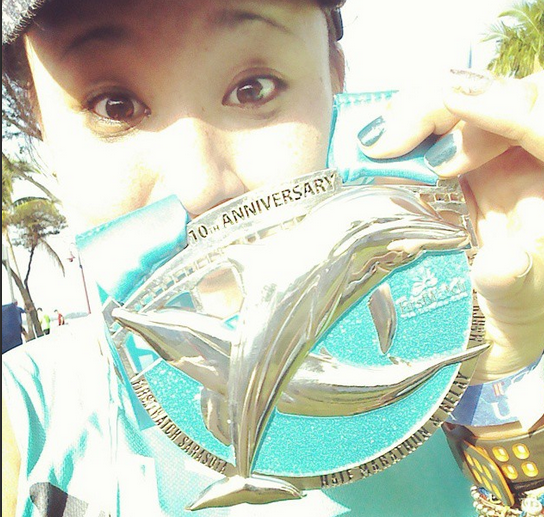 And you can’t go wrong with a dolphin-themed medal! Favorite local races? Definitely the GATE, Best Damn Race and Tour De Pain. Thanks, J! 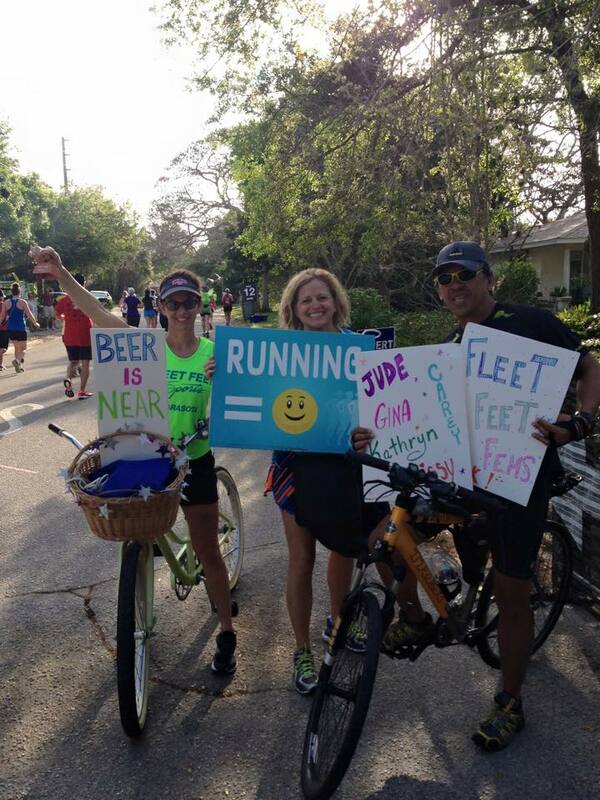 I love running up in your part of FL too. Sounds like you had a great time and the right approach! My mom lives in Venice and maybe one day I’ll be able to do the Sarasota run! Nice race! What are your thoughts on the Zensah ultra compression sleeves compared to the regular Zensah sleeves?